Hey everyone! *phew* third post today! I promise i'm finished! But first I have a super cool guest post for you. Hello A Creative Cookie readers! I am so excited to be here and share a project with you today!! My name is Zoe and I blog over at Scout's Stitches. I blog about a variety of things- crafts, quilting, sewing, cooking and gardening. I try to keep it fun and random. I would love if you came and checked out my site! This spring I decided to make a table runner. I wanted it to be bright and cheery so that it would make me happy every time I saw it. I had a bunch of vintage floral fabrics that belonged to my grandmother. I mixed in one fabric that I had purchased at Wal-Mart. 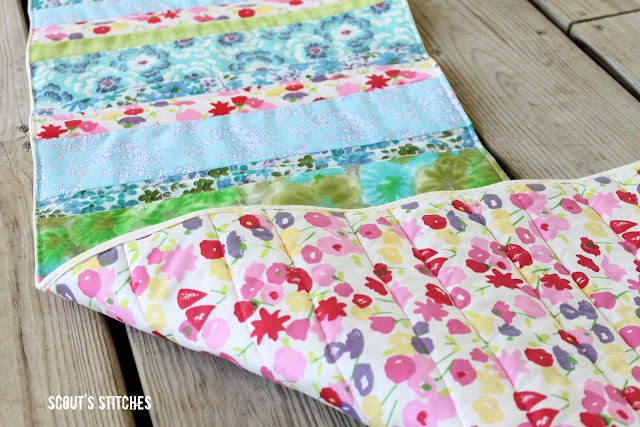 Do you want to make your own spring table runner? Here is how I did it! 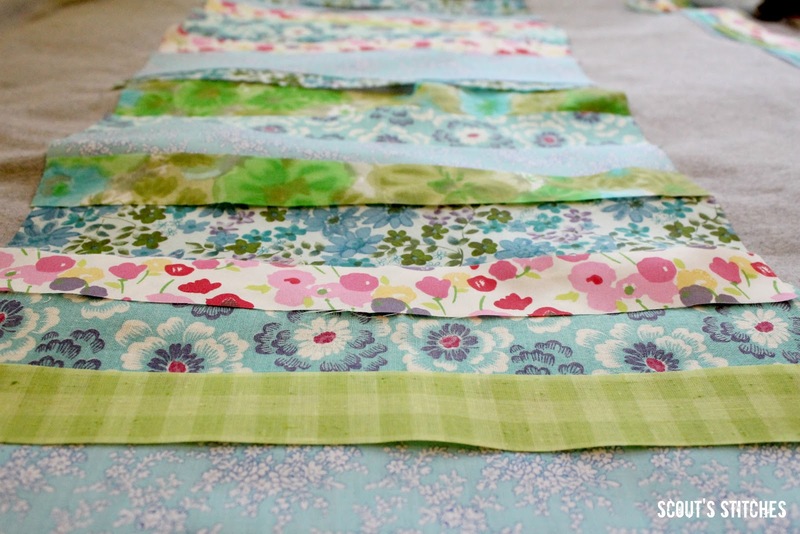 Cut out strips of the fabrics in a variety of 1", 2", and 3" by 13 1/2" long. I chose to keep my accent strips (the pink) all 1" strips. Arrange strips in an order that you like. I tried to get mine to be about 40" total, but the length can vary. Sew each piece to the adjacent, right sides together. Press seams after sewing. Once the top is done cut the batting and backing to be a little bit larger than the top. Using basting spray stack the backing, the batting and the top. Quilt along seams in contrasting thread color. When it comes to adding the binding I still have to check back with a tutorial I found a long time ago. 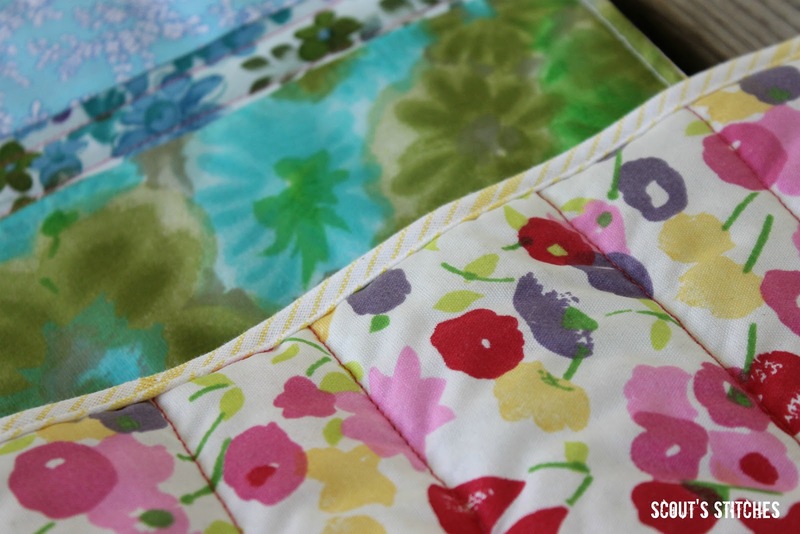 It explains making bias tape and binding the quilt a lot better than I ever could! The video shows how to hand sew it to the back, but I usually just sew it on with coordinating thread on the machine. And then you are done! 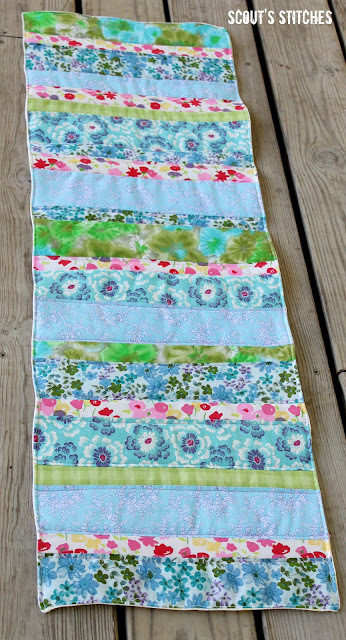 Enjoy Your new table runner!! What the binding looks like on the back. Larger view of the back. Thanks again for having me Kate!!!! That is sooo pretty, Zoe! I love the fabrics.